Violence significantly decreased after the Battle of Ambos Nogales; Battles between Mexican and American forces ceased in 1919. 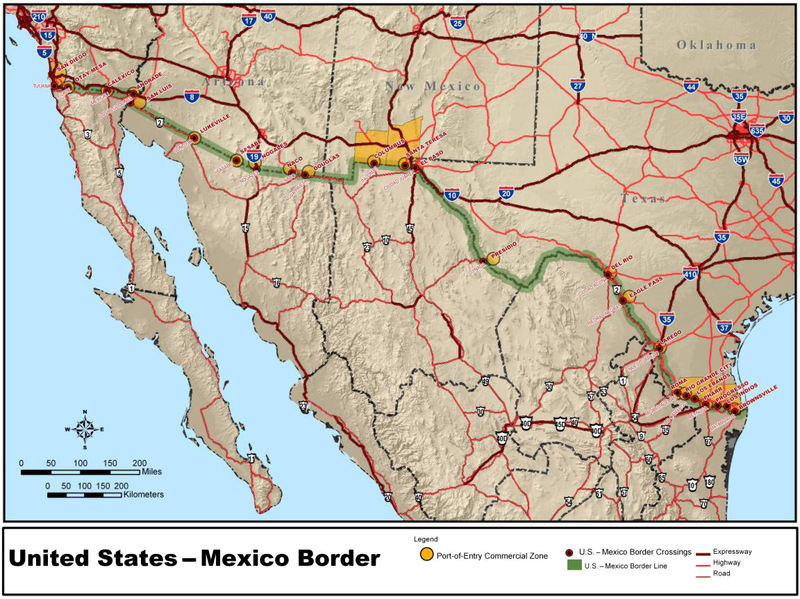 The Border War, or the Border Campaign, refers to the military engagements which took place in the Mexican-American border region of North America during the Mexican Revolution. The Bandit War in Texas was part of the Border War. From the beginning of the Mexican Revolution in 1910, the United States Army was stationed in force along the border and on several occasions fought with Mexican rebels or federals. The height of the conflict came in 1916 when revolutionary Pancho Villa attacked the American border town of Columbus, New Mexico. In response, the United States Army, under the direction of General John J. Pershing, launched an expedition into northern Mexico, to find and capture Villa. Though the operation was successful in finding and engaging the Villista rebels, the revolutionary himself escaped and the American army returned to the United States in January 1917. Conflict at the border continued however and the United States launched several more smaller operations into Mexican territory until 1919 when violence decreased significantly after the Battle of Ambos Nogales. Conflict was not only subject to Villistas and Americans; Maderistas, Carrancistas, Constitutionalistas and Germans also engaged in battle with American forces during this period. Revolutionary activity breaks out in Mexico. United States Army deploys to several border towns to protect American lives and property and to ensure that fighting between rebel and federal forces remains on the Mexican side of the border. In late 1910, Francisco Madero issues the Plan of San Luis Potosí, a proclamation which called for Mexican citizens to rise up against the federal government of Porfirio Diaz, in San Antonio, Texas. 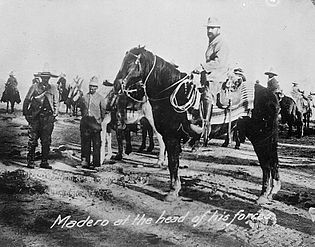 On November 20, 1910 Madero planned to attack the border town of Ciudad Porfirio Diaz across the border from Eagle Pass, Texas. Due to the lack of reinforcements Madero canceled the operation and left to New Orleans, Louisiana to prepare another plan. Pofirio Diaz pressured the United States government into issuing orders for Madero's arrest. Madero escapes across the border back into Mexico on February 14. Magonistas began campaigning in northern Baja California in February. They captured the Mexican border town of Mexicali on February 11 and then marched to Tijuana where they defeated the federal garrison. The Mexican government retaliated and attacked Tijuana in June, forcing the rebels to cross the border and surrender to the United States Army at San Ysidro, California. In March 1911 Francisco Madero led 130 men at the Battle of Casas Grandes in Chihuahua. The rebels lost the battle but later the federals retreated which left Madero's army in control. Madero then began smuggling arms and ammunition on a large scale from across the border. On March 16, 1911 rebel saboteurs in Ciudad Juarez bombed the barracks and homes of the Mexican Army garrison. A large nitroglycerin explosion was seen on the American side of the border. Two days later a large cannon which sat in the town square of El Paso, Texas disappeared and was presumably taken to Ciudad Juarez. Maderista rebels fought federal troops loyal to Porfirio Diaz at Agua Prieta, Sonora in April. United States troops across the border in Douglas, Arizona were attacked by Mexican forces and in response the Americans intervened which left the rebels in control of the town. 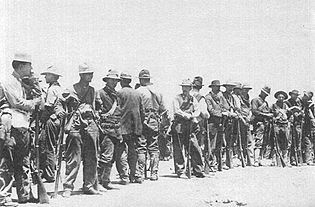 Madero's rebels under Pancho Villa and Pascual Orozco attacked federal forces at the major Second Battle of Ciudad Juarez from April 7 to May 10. The American garrison of El Paso, Texas exchanged fire with rebels resulting in minor casualties on both sides. Porfirio Diaz exiled. Francisco Madero becomes President of Mexico and calls for an end to warfare in the country. He offered to pay rebels of different factions but only if they would lay down their arms or join his new federal Mexican Army. Fighting breaks out between rebel factions. United States Army continues garrisoning American border towns. General Pasqual Orozco rebels against President Madero and begins a campaign in the Mexican border state of Chihuahua. Madero responds by sending an army which defeated Orozco's troops in thee major battles. Villa rebels from the Madero government soon after. Federal Mexican forces of President Francisco Madero establish Fort Tijuana along the international border with California in response to the Magonista campaign. Nogales, Sonora was attacked by General Obregon's army of over 2,000 Constitutionalistas in 1913. Defending federal forces under General Emilio Kosterlitzky collapsed and surrendered to the United States Army garrison of Nogales, Arizona. The Battle of Naco is fought. Alvaro Obregon's rebel army defeated the federal Mexican border town garrison of Naco, Sonora. United States troops watched the battle from across the border. American troops in Naco, Arizona begin construction of Fort Naco, one of twelve forts built by the United States Army along the border for protection against warring Mexican forces. General John Pershing and Pancho Villa meet at Fort Bliss, Texas and would meet again later in 1914 at Ojinaga. On April 9, the Tampico Affair, an incident in Tampico between United States Navy sailors and Mexican troops, occurred. It resulted in the severing of diplomatic relations between Mexico and the United States. In response to the Tampico Affair, President Woodrow Wilson asked Congress to approve an armed invasion of Mexico. Congress approves the invasion. The United States Navy's Atlantic fleet under Admiral Frank Fletcher was sent to Veracruz and occupied the city after an amphibious assault and a street battle with Mexican defenders. The longest battle of the Mexican Revolution was fought at Naco, Sonora, across the border from Fort Naco and Naco, Arizona. Pancho Villa's men attacked General Obregon's garrison on October 17, 1914. During the 119 following days of siege warfare Villa was defeated. Also during the battle several United States Army Buffalo Soldiers stationed in Naco, Arizona were wounded by rebels shooting into their camp. Eight men were wounded but they did not return fire and were later recognized for their good discipline. Pancho Villa and Emiliano Zapata capture Mexico City but soon after are forced to retreat by Alvaro Obregon's army. Carrancistas draft the Plan de San Diego, an operation to overthrow the American state governments of Texas, New Mexico, Arizona, and California by starting a race war. The plan was discovered by the Americans after a Carrancista leader was arrested in Texas though some fighting did occur in the form of raids, launched by rebels into Texas territory. Pancho Villa attacks General Obregon's Constitutionalist garrison at Nogales, Sonora. Villa initiates a siege but over time is defeated due to the lack of artillery and insufficient supplies. 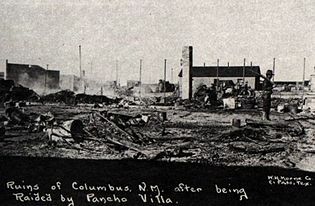 During the siege the United States 12th Infantry garrison of Nogales, Arizona was attacked by Villistas and in turn skirmished for a half hour. Only one American was killed along with several of Villa's rebels. Villistas and Constitutionalists fought again at Agua Prieta in November 1915. Later Villa attributed his defeat to large searchlights used during the battle by the United States Army garrison of Douglas, Arizona. The battle ended in defeat for Villa and led to the more disastrous Battle of Hermosillo on November 21, 1915. During which Villa's forces pillaged the city instead of fighting the garrison, resulting in a repulse. Also at this time Constitutionalist forces were allowed access to American railways for troop movement. The January 1916 San Isabel Massacre occurred. Villistas stopped a train near Santa Isabel, Chihuahua and killed eighteen American passengers from the ASARCO company of Tucson, Arizona. Now losing the war, Pancho Villa decided to raid Columbus, New Mexico for supplies on March 9, 1916. The raid did not go as planned and Villa's 500 cavalrymen were defeated by over 300 United States infantry and cavalry who were stationed in a border fort outside of town. 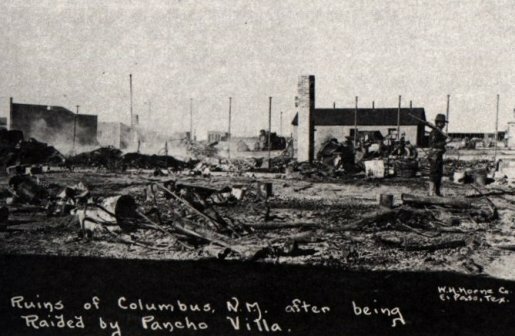 Columbus was heavily damaged by the Villistas who burned several of the town's buildings. Sixty to eighty Villistas were killed along with over a dozen American troops and civilians. In response to the attack on Columbus, American President Wilson ordered General John J. Pershing to proceed into Mexico with over 5,000 men to capture or kill Pancho Villa, thus beginning the Pancho Villa Expedition. On May 5, 1916 Villa's rebels attacked two more American border towns, Glenn Springs, Texas and Boquillas. Over 200 men under Rodriguez Ramirez and Natividad Álvarez crossed the Texas border with the intention of capturing supplies. At Glenn Springs a United States Army squad of nine men resisted the Villista attack for several hours but eventually the raiders set fire to the adobe building the Americans were held up in and forced the 14th Infantry men to retreat. Three of the United States troops were killed and four others were wounded. One young American boy was also killed by the Mexicans. At Boquillas, twelve miles from Glenn Springs, the Americans there captured Alvarez and discovered he was a Lieutenant Colonel in Pancho Villa's Division del Norte and was a veteran of the Battle of Celaya. The raiders of Glenn Springs and Boquillas took two captives with them when they withdrew across the border. Jesse Deemer and Monroe Payne who were later rescued by American Army forces during a small cavalry expedition into Mexico. The expedition of eighty men, two wagons and a car began on May 8 from Marathon, Texas and was under the command of Colonel Frederick W. Sibley and Colonel George T. Langhorne. The rebels were held up at El Pino, Chihuahua and at first Colonel Langhorne negotiated for the release of the two Americans and when this failed he ordered his men to embark his personal car and head for El Pino. Upon their arrival the Villistas fled and Deemer and Payne were freed. During the operation which ended on May 21, five Mexicans were killed in skirmishes with no American losses. President Wilson orders the National Guard to reinforce the United States Army garrisons at the border line. By August 1916 an estimated 117,000 guardsmen were stationed along the border in Texas, New Mexico, Arizona and California. On April 12, 1916, American forces and Carrancistas fight the Battle of Parral in Chihuahua. When United States troops under Major Frank Tompkins attempted to leave the city of Parral they were attacked by Carrancista riflemen. The Americans returned fire and over the course of several hours forty-five Mexicans lay dead along with two Americans. The engagement marked the furthest penetration into northern Mexico by American forces, Parral is over 500 miles from the border. In June Buffalo Soldiers of the 10th Cavalry suffered a defeat at the Battle of Carrizal. Federal Mexican troops attacked 100 cavalrymen when they attempted to enter the town of Carrizal. The most famous battle of the Border war was fought and ended with the deaths of forty-five Mexicans and sixteen Americans. Forty-four other Mexicans and Americans were wounded. Raids on American border towns continued during and for years after the Pancho Villa Expedition. On June 15, raiders killed four American soldiers at San Ygnacio, Texas. On July 31 another soldier and a United States customs inspector were killed in a second raid. During both engagements Mexicans were killed or wounded but their casualties are not known. Future General George S. Patton of the 8th Cavalry conducted America's first assault with armored vehicles at a ranch near San Miguelito, Mexico. Three Mexicans were killed including the Villista General Julio Cardenas. Patton is said to have carved notches into the pistols he carried, representing the men he killed with them. Due to the defeat at Carrizal, President Wilson ordered General Pershing to withdraw from Mexico and end the expedition. By January 1917 most of the American expeditionary troops had left Mexican territory and were back at garrison duty along the border. The Zimmermann Telegram was intercepted by the British in 1917. In the telegram the German government formally requested that Mexico join World War I on the side of the Central Powers. 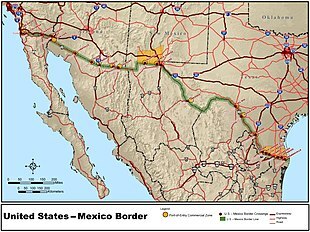 The Germans asked the Mexicans to attack the southwestern United States and promised to return land to Mexico that was lost to the United States during the Mexican-American War and the Gadsden Purchase. Mexico ignored the request but the United States did not and used the affair as a reason to declare war on Germany. So began the American entry into World War I. 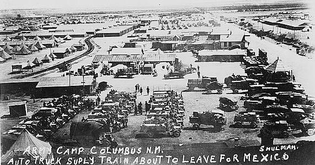 United States Army Intelligence stationed at Fort Huachuca, Arizona detected a German military presence in Sonora and ordered troops to begin surveillance operations to prepare for war with Mexico. Mexican railways, train stations, and other related enterprises were inspected as possible routes for a large scale American invasion. Revolutionary Yaqui native Americans established a base in Bear Valley, Arizona to store weapons intended to be smuggled into Mexico. When the base was discovered by the United States Army, Blondy Ryder of the 10th Cavalry was ordered to evict the rebel Yaquis. On January 9, 1918, Ryder's patrol attacked the Yaquis in a small half-hour engagement. The camp was destroyed, one Yaqui was killed, and nine others were captured. The United States Cavalry suffered no casualties. In mid August, Lieutenant Colonel Frederick J. Herman received an anonymous message from a Mexican revolutionary about a possible attack on Nogales, Arizona by federal Mexican soldiers and a group of German military advisors. A few days later on August 27, a Mexican suspected of gun smuggling crossed the border into Nogales, Sonora followed by an American Custom agent and two United States Army troops. A Mexican soldier watched the incident and fired on the American agent. The shot was a miss but hit one of the soldiers instead, the remaining two Americans returned fire and killed the Mexican soldier. From there the incident escalated from a small dispute into a battle. 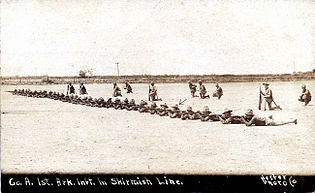 Reinforcements from both sides rushed to the border to fight, men of the 35th Infantry Regiment called for aid and a squadron of 10th Cavalry under Herman responded. When they arrived they attacked the Mexican positions on top of hills along the other side of the border. The assault was successful and the Mexican troops with their German advisors were defeated. Thirty to 129 Mexicans, two Germans and seven Americans died in the fighting. After the battle German military activity in Sonora ceased. The Battle of Ambos Nogales became the last major engagement of the Border War. American and Mexican forces skirmished near El Paso, Texas on June 16, 1919. ↑ Matthews, Matt M. (2007). The US Army on the Mexican Border: A Historical Perspective. Fort Leavenworth Kansas: Combat Studies Institute Press. pp. 101. ISBN 978-0-16-078903-8. http://www.cgsc.edu/carl/download/csipubs/Matthews_op22.pdf. Retrieved August 5, 2011. Weber, John W. (2008). The shadow of the revolution: South Texas, the Mexican Revolution, and the evolution of modern American labor relations. ProQuest. ISBN 0-549-96152-6.